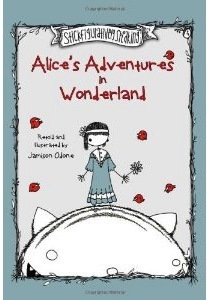 Alice’s Adventures in Wonderland (Stickfiguratively Speaking), retold and illustrated by Jamison Odone. Published by PublishingWorks, 2010. Hardback. 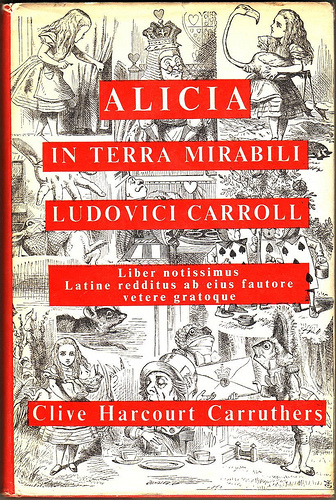 I really like this version- a shortened version of the text is interspersed with Alice’s own (slightly petulant) pronouncements. She’s fab. Literary nonsense turns to whimsical imagery with a macabre twist in the pen-and-ink drawings of Jamison Odone. Stick figures have never emoted this much energy as each page brings a certain curiosity to a new light in this deconstruction of Lewis Carroll’s classic. Starkly black and white, these stick characters are as much a quandary as their literary, cartoon and theatre counterparts ever were. Omitting much of the melodic verbiage of the original, STICKFIGURATIVELY SPEAKING creates a simple variation with an exquisitely sophisticated twist that’s already being compared to Edward Gorey. 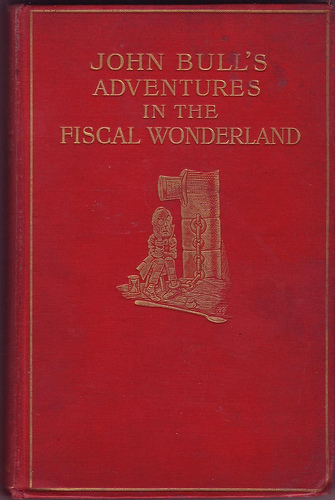 John Bull’s Adventures in the Fiscal Wonderland by Charles Geake, with 46 illustrations by Sir Francis Carruthers Gould. Published by Methuen & Co. 1904, first edition hardback. No dust jacket. Bought for me as a thanks by the lovely Michael when he stayed with me for a while. 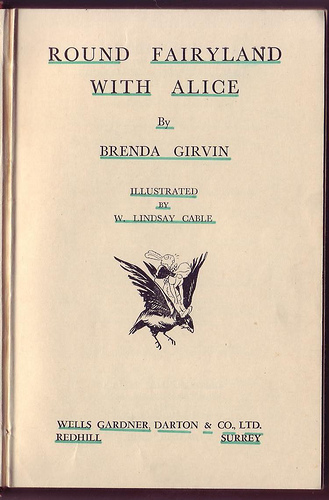 Round Fairyland with Alice by Brenda Girvin. 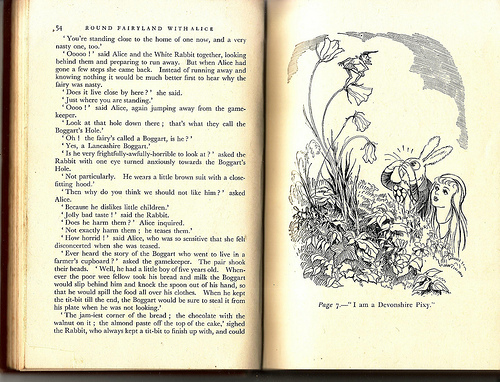 Illustrated by W. Lindsay Cable. All the contents and title pages underlined in felt pen, and chapter headings ticked. Shame. Alice and the White Rabbit tour Fairyland with the ‘Professor’ and learn about the fairies and folklore of England, Scotland, Ireland and the Isle of Man. They meet Queen Mab, pixies, mermaids, Red Men and Cluricane. Alice in the Country of Hearts Volume 2 by QuinRose. Published by Tokyopop, 2010. 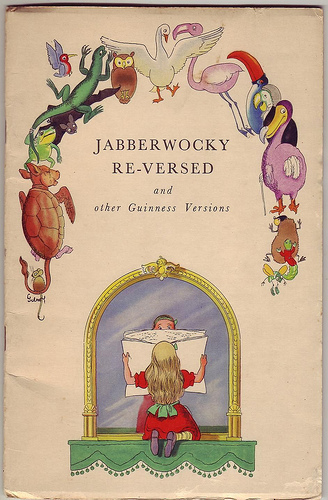 First edition paperback. I love the cover: the tea party looks really rather tempting. As Alice grows accustomed to life in Wonderland, she begins to understand the inner workings of this mysterious world. Everyone desires to get close to her, and Alice’s life lights up with little moments of happiness. But she soon discovers the truth behind all the bliss… and wasted lives. And how will Alice react when the greatest secret is revealed by Julius, the one and only clock repairer?! Basically, Alice Liddell is transported to a Wonderland filled with handsome young men loosely based on Wonderland characters, who all seem to want to fall in love with her. It’s Alice as a dating game, crossed with a computer game. Sort of fun in a bizarre kind of way. This is volume 2.